As someone with a taste for video games with heavy narrative focus, such as interactive fiction or even alternate reality games, Ice-Bound is incredibly exciting. This is a game with an interactive story, but to really explain what that means takes a bit of work. First, let’s go over the very generalized story concept. In Ice-Bound, there is an abandoned polar base called Carina Station. Over the years new buildings and people have resided there and all of this intrigued author Kristopher Holmquist. He penned a story with Carina Station as its locale but died before finishing the work. Alongside an AI known as KRIS, you must attempt to reconstruct the story and instruct how it should end. Of course, KRIS is no pushover and will require proof from the late author that each storyline was really intended to play out in a certain way. This is where augmented reality (AR) comes in. Accompanying the game is The Ice-Bound Compendium. With the 80 page book players can then use their iPad (or computer’s webcam) to share its pages with KRIS. Each page can persuade the AI, although some content should be kept private. Ice-Bound players will be directly shaping how Holmquist’s fictional tale plays out. With such a cool concept it’s no surprise that 1/3rd of the required $9,500 funds were raised on its Kickstarter debut. Fans of interactive fiction and augmented reality should definitely investigate this project further. Right now Ice-Bound is only guranteed for use on PCs with webcams and iPad 2 (or newer) but an Android port might appear as well. 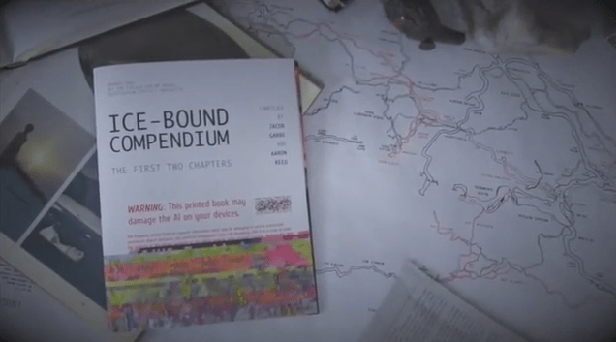 Pledging $20 or more for The Ice-Bound Compendium includes the game and also happens to be the cheapest way to nab a copy. Track the progress of the Ice-Bound Kickstarter by heading over to our Campaign Calendar.